If you loved bread before you started keto or went gluten free, going without can be a hard adjustment to make. What do you eat with your tea? Dessert? As a snack? 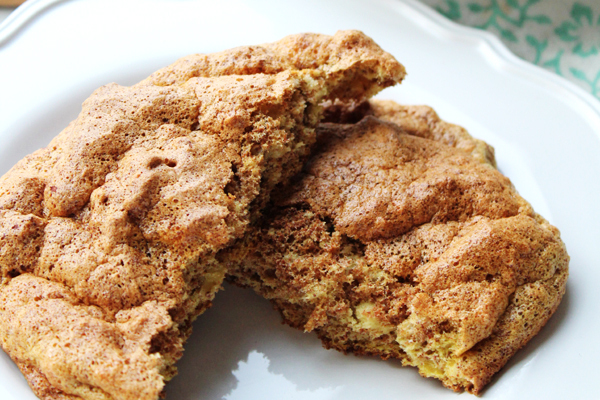 This delicious cinnamon cloud bread is the answer to your bready keto cravings. I like to eat them as-is with a cup of tea or bulletproof coffee. If you need a fat and protein boost, smear it with some almond butter and maybe even add a couple sliced strawberries. YUM! The inspiration for this recipe came from the "english muffins" recipe on page 158 of Vanessa Spina's book Keto Essentials: Your Complete Guide to the Ketogenic Diet (get it on Amazon or Barnes & Noble). 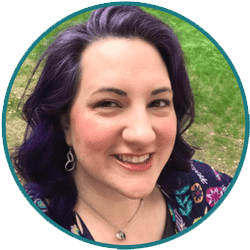 Her book has all kinds of really creative keto recipes (all of which are also gluten free!). If you're looking for a great keto cookbook, I highly recommend it. If you want a cloud bread that is more well suited for savory applications, leave out the xylitol, vanilla and cinnamon (but do whisk the egg yolks with the sour cream before adding them to the egg whites on step 5). I love topping mine with cream cheese, lox and capers for breakfast or an easy lunch. Unlike other cloud bread recipes, this cloud bread is made with sour cream. I find sour cream is easier to mix smoothly (as opposed to cream cheese). But you didn't come here to hear me ramble. You want to learn how to make this bread! Let's get down to it! 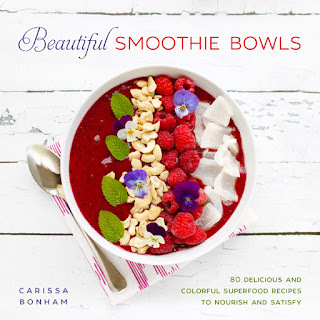 If you are looking for an easy smoothie bowl recipe to help you overcome the winter blahs, this Sunny Days smoothie bowl from my book Beautiful Smoothie Bowls will perk you right up! 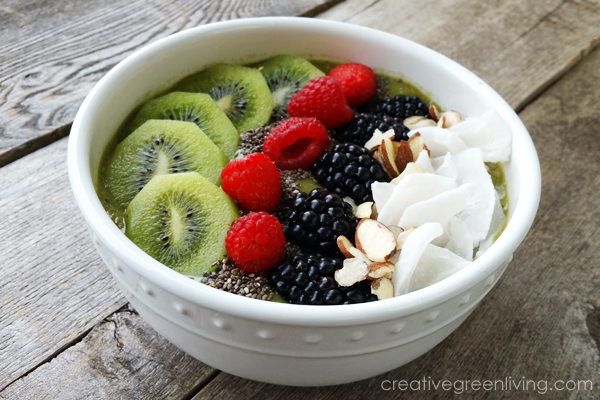 Even if you have never made one, this easy recipe will teach you how to make a smoothie bowl. And if you love it, please be sure to come check out my collection of 80 of the best smoothie bowl recipes in Beautiful Smoothie Bowls. You'll have a great collection of smoothie bowl recipes and nice cream recipes to keep you fueled up and healthy all year long. 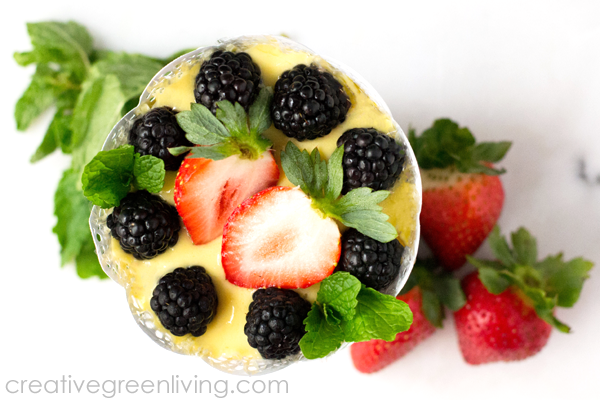 If your Instant Pot does NOT have the "yogurt" button, follow my tutorial as written. 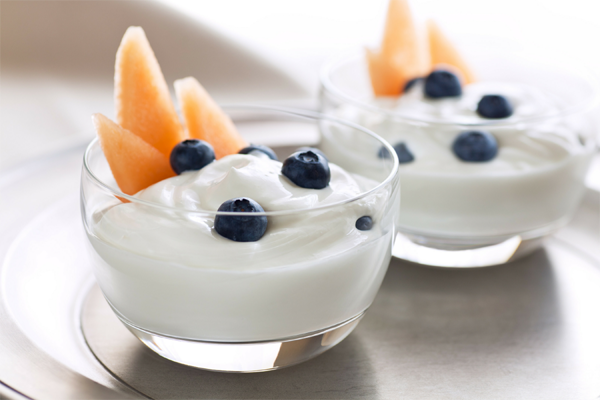 If your Instant Pot DOES have the yogurt button, How to Make Yogurt in Your Instant Pot from Super Healthy Kids is fabulous and will give you even more precise steps with photos for making yogurt with that specific appliance. My feelings won't be hurt if you pop over there and follow along with her. It's nearly identical to how I will show you how to make yogurt below but utilizes a neat feature of the instant pot that will keep it warm for as many hours as you need - no towels required! If you have ever wondered how to make protein cookies, you have come to the right place! When PlantFusion got in touch with me to ask about partnering with them to show off their awesome plant-based proteins I was excited to try them in some non-traditional ways - like in a baked good! I've seen a lot of people online asking if you can use protein powder in baking and I'm happy to say the answer after some extensive testing is YES (for PlantFusion anyway - no promises about anyone else's protein). I spent several days baking batch after batch of protein oatmeal cookies and getting feedback from my kids and husband and I think what I've come up with here is pretty awesome! 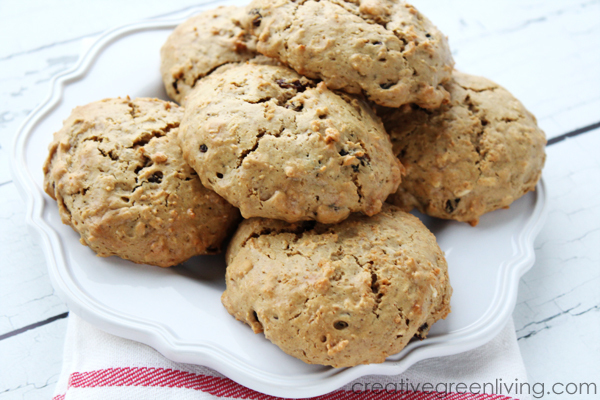 They have a great oatmeal cookie flavor and boast a whopping 11 grams of protein! These would make a great afternoon snack when you need something with sticking power. If you don't normally eat breakfast, these would be a great alternative to help fuel you without having to eat a whole plate of food. 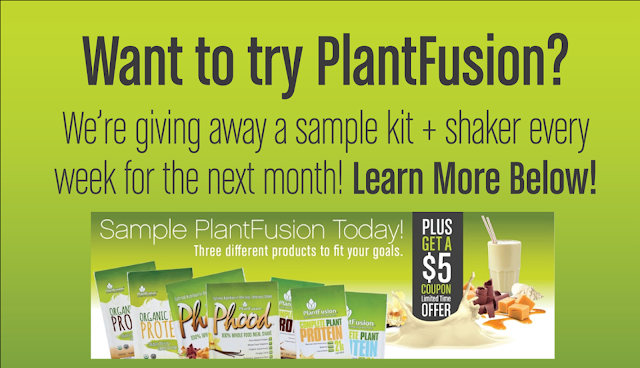 Thank you to PlantFusion for sponsoring this post! Be sure to read all the way through and enter the giveaway at the bottom for the sample kit of your choice! 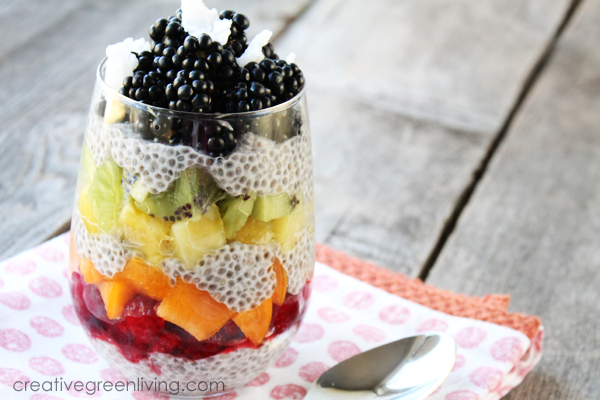 Have you been wondering what all the fuss is about chia pudding? In addition to it being a magical science experiment, chia pudding is pretty rad because it gives you a big boost of both fiber and calcium. When you eat it for breakfast, it's like starting your day with a fancy dessert - you can't go wrong with that can you? 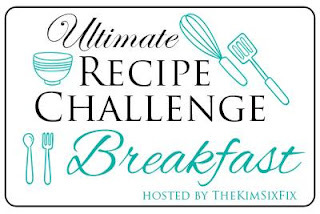 Be sure to keep reading after the recipe because 20 of my blogging friends and I have teamed up to bring you even more great breakfast recipes at the bottom of this post! Sometimes a side dish for dinner is beyond me. The thought of throwing together a batch of biscuits or a decent salad sounds lousy, so smoothies have become a regular at dinner (and at breakfast and lunch). I often freeze fresh some fruit a few days in advance, and just throw in a little bit every time with a piece or two of fresh fruit. It adds a nice sweet element to a meal while still providing lots of nutrients. 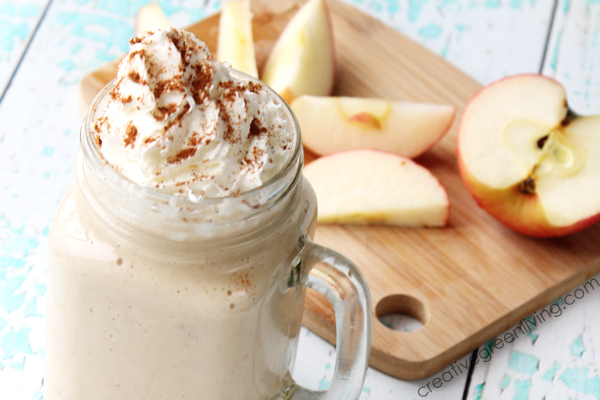 This delicious vegan smoothie is a recent favorite! It feels fresh and summery! 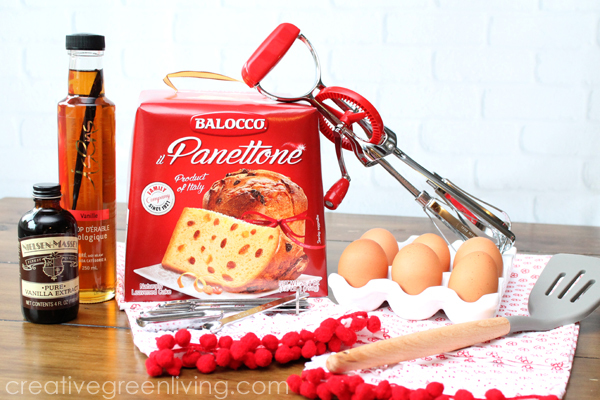 It will be perfect for your last minute dinner prep or even an upcoming brunch! Do you ever have a weeknight where you are too tired to cook? Or it's hot out and you don't want to warm up the house even more by cooking? I'll admit it: I've had several of these nights lately. Instead of ordering a pizza, though, I've been making smoothie bowls - and my family is loving it! 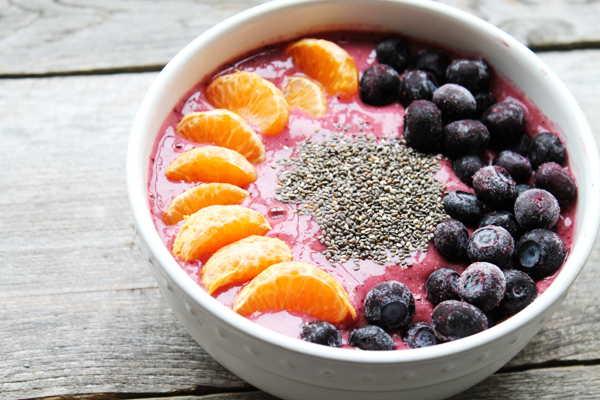 Making a smoothie bowl takes less time than picking up take-out and is SO MUCH BETTER for you. Plus, when you make your smoothie bowls extra thick, your kids will feel like they are eating ice cream for dinner - but it's actually full of healthy fruit, seeds and veggies. WIN! Before we jump into the recipe, I want to thank Earthbound Farm for sponsoring this post. They have a delicious variety of organic salad mixes that are great for salads, sides, smoothies and more. During the month of April, pop over to EveryCartCounts.com to take a quiz and get a coupon for $1 off any Earthbound Farm product (plus they will plant a tree for every quiz taken - up to 20,000!). Awesome! Let's hop into the recipe shall we? So you've seen the smoothie bowl trend and now you want a part of the action? I'm here to help! I am constantly on the go and end up drinking most of my smoothies through a straw. A smoothie bowl, though, is a great change of pace. It gives you the nutritional power of a smoothie and the satisfaction of any other kind of breakfast you eat with silverware. It helps you slow down a bit to become more mindful of what you're eating instead of gulping it down on the go. Plus the toppings are great. The toppings can really make or break a smoothie bowl. When I posted this smoothie to Instagram this week, I saw people mentioning they had never had a smoothie bowl before and wanted some detailed directions. So here they are! Can't get enough pumpkin pie in your life? 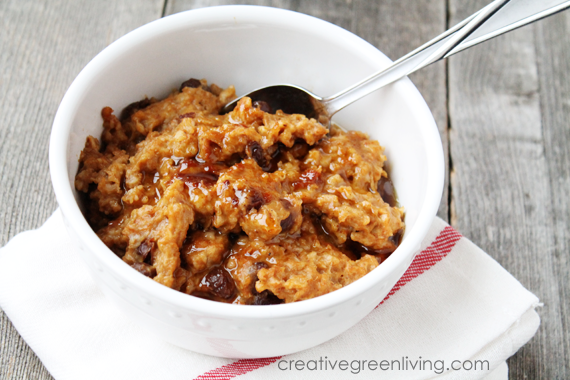 This tasty pumpkin pie oatmeal cooks in your programmable crockpot or rice cooker (this is the one I used) to have a healthy, hearty breakfast ready for you when you wake up. Cooking the oatmeal with the maple syrup helps the sweet flavor permeate the oatmeal - feel free to top it with just a bit more when you serve it. We are working on a second round of Whole 30 and some mornings are just so crazy busy it's all I can do to make some scrambled eggs. These muffins are super easy to make and are freezable. Just pop them in the microwave to warm them up and top with some guacamole. 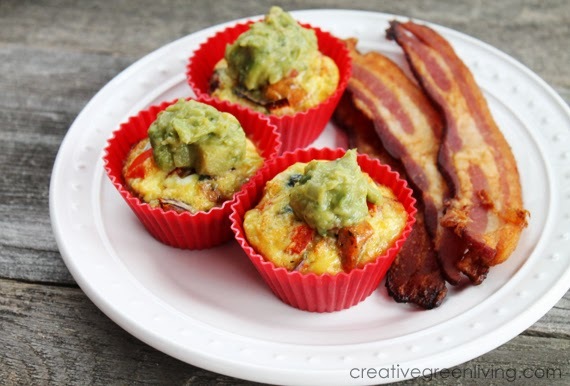 Of course everything is better when served with a side of bacon - and these are no exception! If you're not doing Whole 30 or if you're on a modified Paleo diet, these would also be delicious with a sprinkling of cheddar and some sour cream. This post brought to you by National Peanut Board. All opinions are 100% mine. If your family is like mine, your mornings can get hectic - especially on days when people need to get out the door in order to be on time for work, school or church! I have definitely been guilty of feeding my family something low in nutrition for breakfast just because it was quick and easy and we needed to leave about five minutes ago. Sound familiar? To help combat the quick vs. nutritious battle raged in home nearly every morning, September has been declared Better Breakfast Month. So if you need help with better breakfasts, I'd like to present you with my new kid friendly recipe: The Peanut Butter Banana Protein Pancake Stack. At the beginning of the week (or over the weekend), whip up a big batch of my super delicious protein pancakes (they happen to be gluten free, too!). 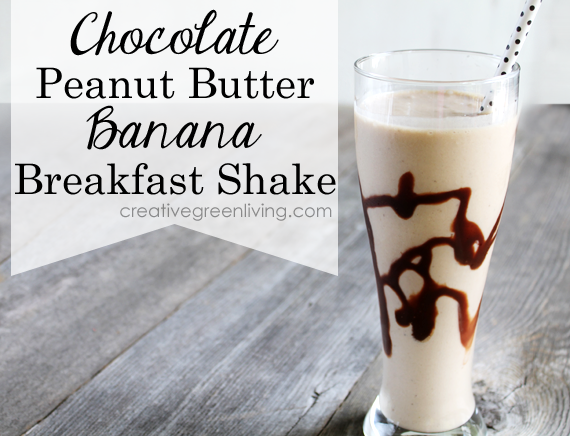 Save them in the fridge and grab them to make this kid friendly breakfast packed with plant based protein as well as 30 essential nutrients and phytonutrients - and that's just from the peanut butter! All together this recipe has 22 grams of protein and 32% of your recommended daily iron intake. Not a bad way to start your day! I was introduced to the idea that you could make pancakes without flour in college. My youth pastor's wife was working through Eating for Life and the author has a similar recipe. I've modified it to make it more whole foods friendly (not to be confused with Whole 30 compliant - as these are definitely not!). These pancakes also happen to be gluten free but are super delicious and will be adored by both gluteny and gluten free family members alike. 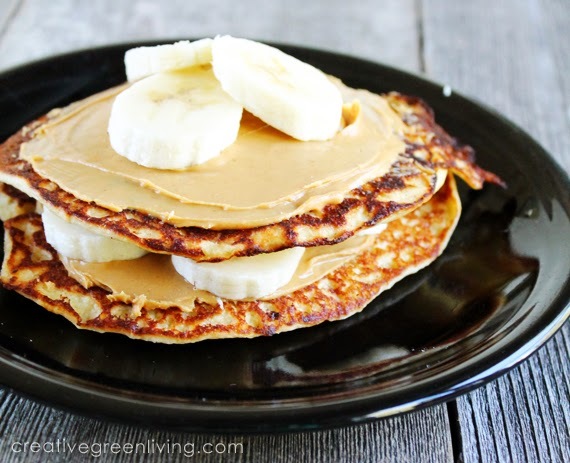 Each pancake has almost 5 grams of protein, making a plate of 4 or so a great start to your day - especially compared to Biquick pancakes which have nearly twice as many calories and a third less protein. 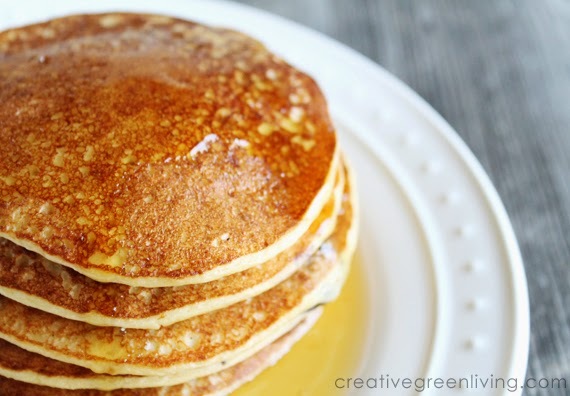 Nutrition information is approximate (PER PANCAKE) and may vary based on the freshness and brand of your ingredients as well as the size of your pancakes (recipe should make 12 pancakes). Nutrition information calculated at: Calorie Count. Add ingredients to a blender in the order listed. Blend on high for 1-2 minutes until mixture is homogeneous and liquefied. If blending is too difficult, you may add some milk or milk alternative 1/4 cup at a time to facilitate blending. Don't add more than a 1/2 cup of milk total. Preheat a skillet on medium high heat and grease with coconut oil. Pour pancake batter from blender onto skillet. One batch of mix should make 12 pancakes 4-5 inches in diameter. Cook until edges are drying out and center has bubbles before flipping to cook the other side for 3-4 minutes. Remove cooked pancakes from skillet. 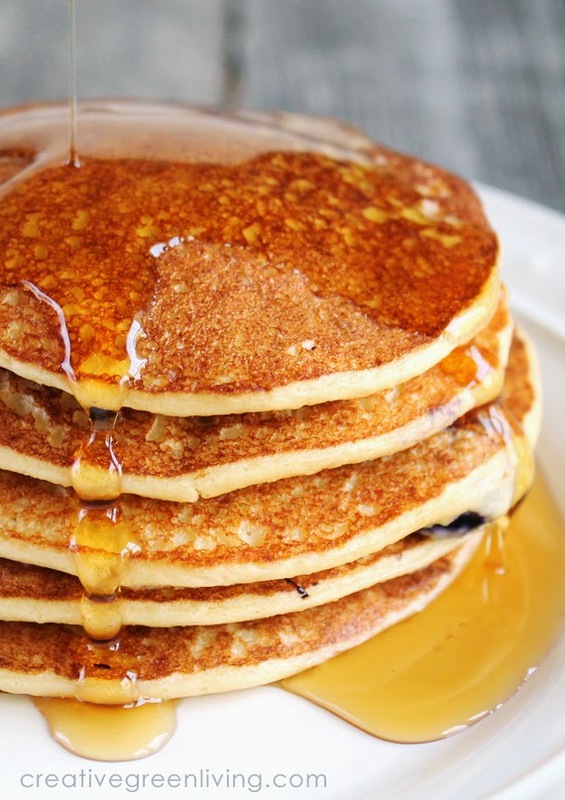 Serve warm with real maple syrup or berry mixture. 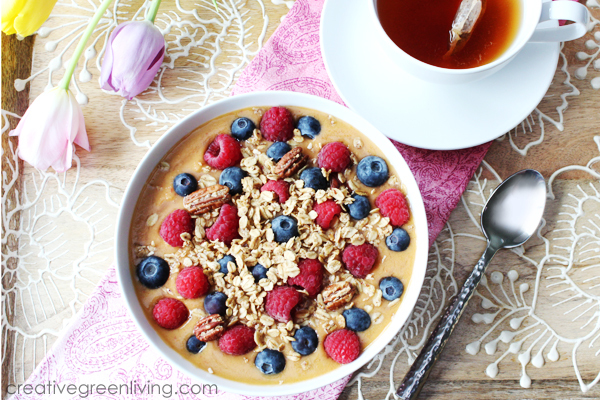 Do you find it hard to get a healthy breakfast in your belly in the mornings? I definitely have mornings when I don't think I'm hungry when I'm home but 10 minutes later, I'm driving down the road and realize my body needs breakfast. If I planned ahead, this isn't a problem. On mornings I didn't plan ahead? Let's just say it can get ugly when your only options are Starbucks or fast food. Coffee creamer is one of those things that really makes or breaks your cup of coffee. Almost all store bought creamers, however, are made with a variety of GMO derived ingredients including corn syrup solids or high fructose corn syrup. EW. 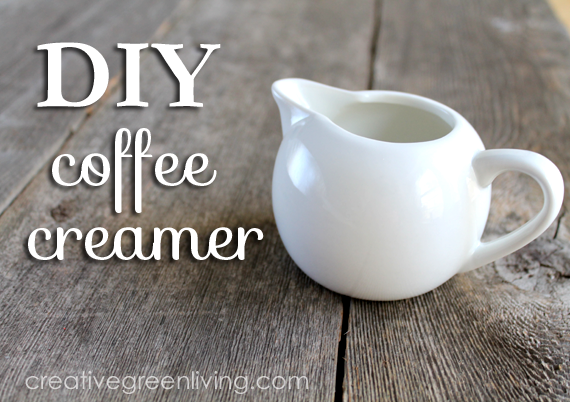 Luckily, making your own creamer is super easy and cost efficient, too! I love how much variety there is in the world of green smoothies. You can make a smoothie that tastes green or you can make a green smoothie that isn't even green at all (like the sneaky green smoothie). 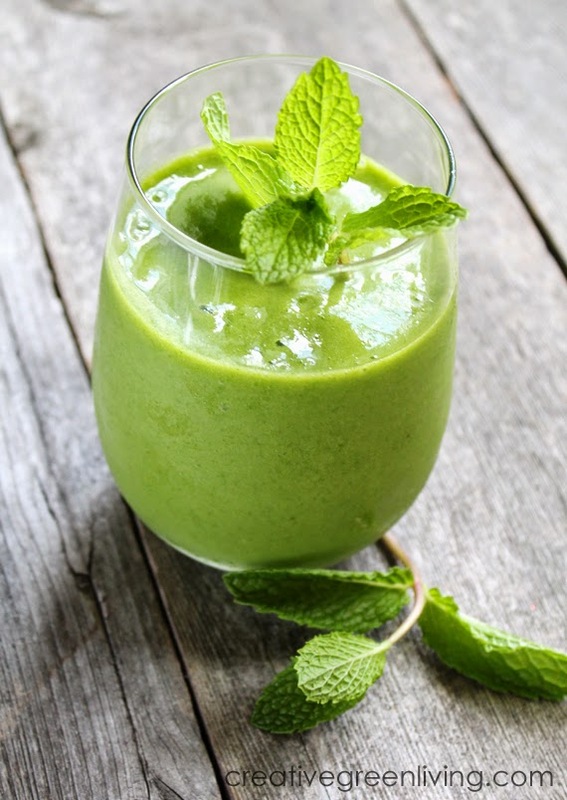 This smoothie is more of an intermediate green smoothie - it's clearly green and while you can taste a bit of of the green as you drink it, the overall flavor profile is tropical and delightful. Even my four year old loves it! Add the watermelon, lime juice, spinach, parsley and mint to blender and blend for several minutes until very smooth and no green chunks remain. Add frozen strawberries, pineapple and mango and blend. 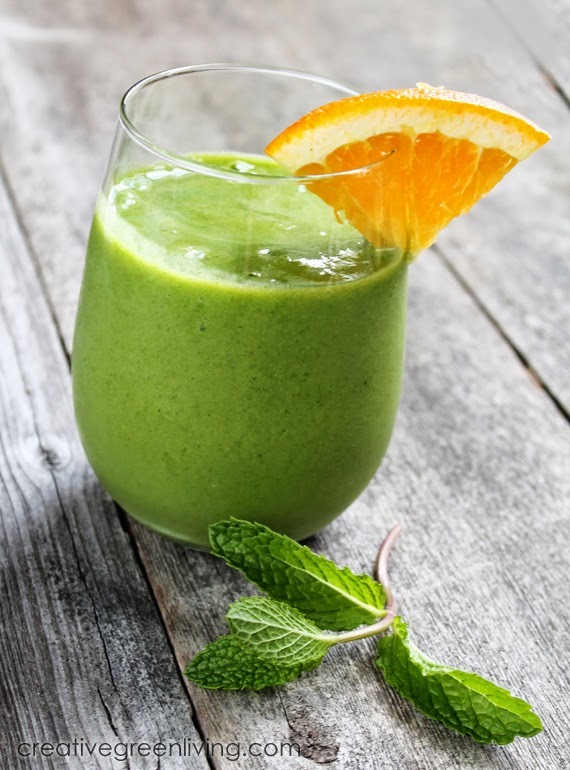 If the smoothie is very thick or becomes difficult to blend, add green tea or coconut water a 1/4 cup at a time until the desired consistency is reached. There is no shortage of love around here for smoothies (check out my Smoothies and Juice category for more tasty recipes!). Lately, as I've been approaching my due date, I've been trying to be more intentional about my iron intake - which means a lot of green vegetables. And a girl can only eat so many salads! Smoothies have been my savior in this regard. 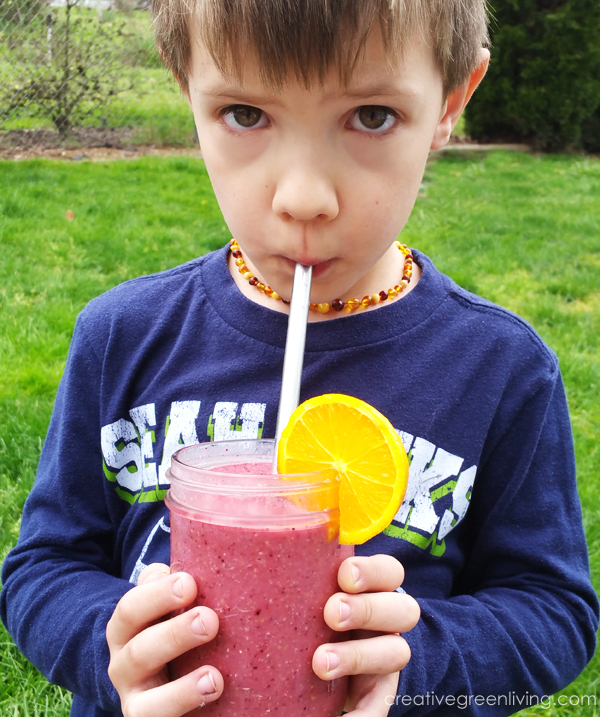 Recently, Skyhorse Publishing sent me a copy of The Healthy Smoothie Bible by Farnoosh Brock. 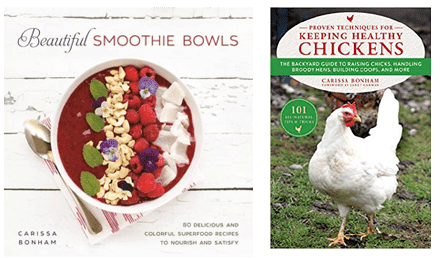 Farnoosh blogs at Prolific Living and has compiled a collection of 108 healthy smoothie recipes in this book - including a nice collection of green smoothies (perfect for helping me boost iron!). I gave a couple recipes a whirl (see what I did there?) and loved this Limy Minty Charm. Not only was is delicious but it had a great consistency and didn't separate when my husband drew out how long it took him to drink it. 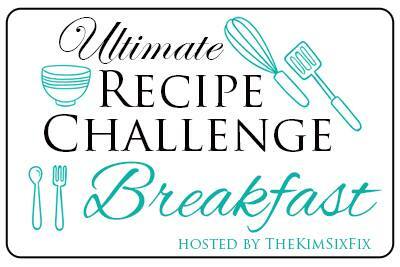 Check out the recipe but be sure to scroll down to the bottom to enter to win a copy of The Healthy Smoothie Bible for yourself! Add all ingredients except frozen pineapple to blender and blend on high until all greens are well blended and no chunks remain. Add pineapple and blend until no chunks remain. This recipe was republished with permission from Skyhorse Publishing. 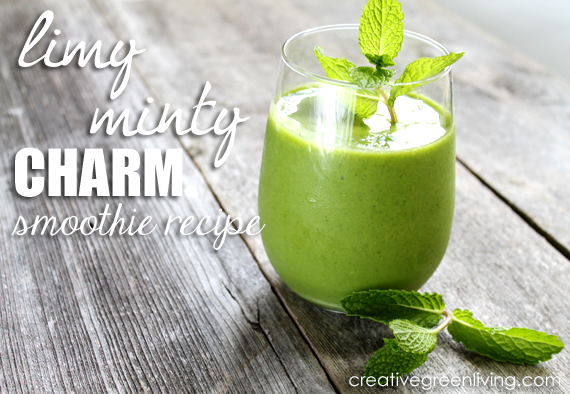 Limy Minty Charm Smoothie recipe appears on page 174 of The Healthy Smoothie Bible: Lose Weight, Detoxify, Fight Disease, and Live Long by Farnoosh Brock. Photography is my own. Now its time to giveaway a copy of The Healthy Smoothie Bible to one lucky reader so you can make this and 107 more recipes that each look delicious! The book also has great information about nutrition, when smoothies make more sense than juice, and a variety of supplements you can add to the smoothies! Sadly, you've missed the giveaway. BUT you can still order this book on Amazon! 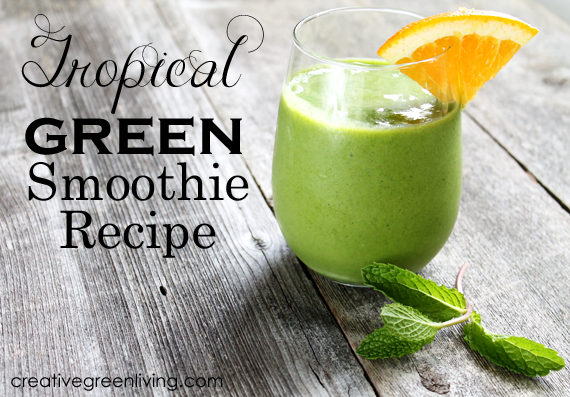 *Please note that neither Creative Green Living nor this recipe are in any way related to Jamba Juice or their line of "fruit-refresher" smoothies. 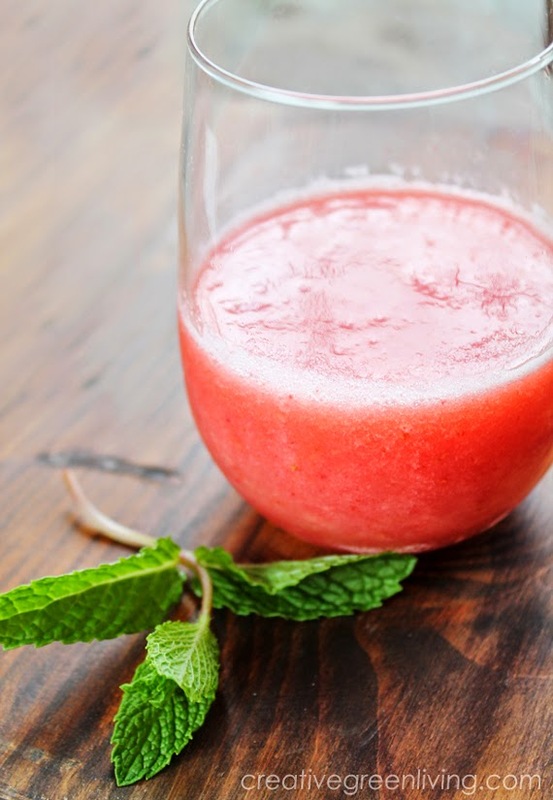 Lucky for me, if you add it to some sweet summer fruit and take it through a whirl in your blender, you have a delightful drink that will keep you hydrated and give you an extra nutrition boost, too! This smoothie is light and sweet and tastes like summer in a glass. Add all ingredients except strawberries to blender. 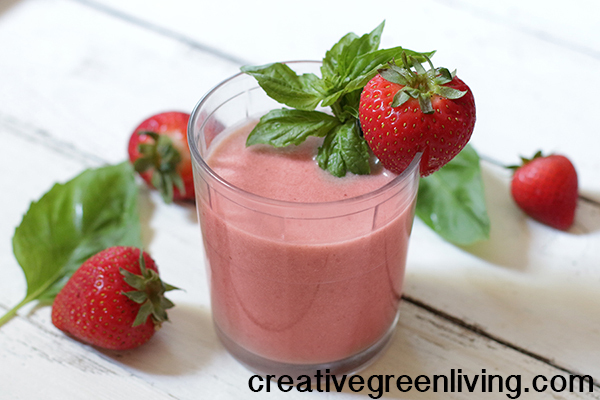 Blend until watermelon is well incorporated and no longer grainy. Add frozen strawberries and blend until desired consistency is reached (add extra coconut water or watermelon if it is too thick, add extra strawberries if you need it to be thicker). 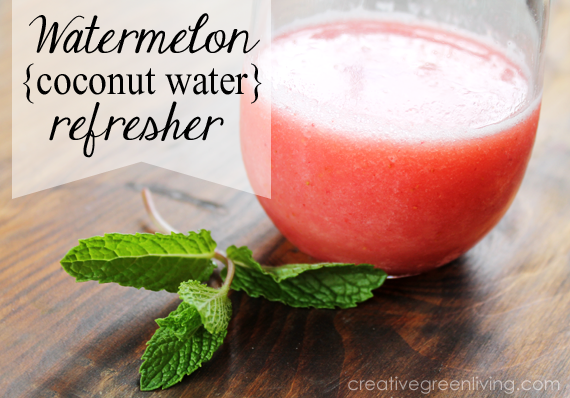 Serve with a sprig of fresh mint and sip through a straw while relaxing on your back porch!